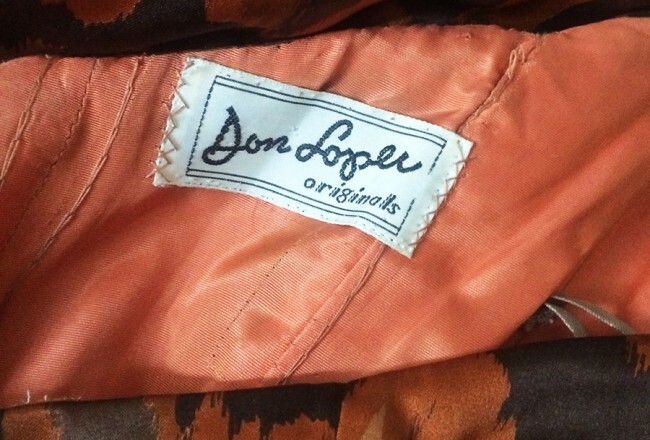 I found this jacket at the flea market a few years ago, and it sat around waiting for me to research it for at least a year. When I finally did, I found a remarkable story. Hansi wearing a sweater of her own design. Hansi Originals was the boutique of Hansi Landis, who was born Johanna Wolf in Vienna in 1909. Her family owned a delicatessen, and she grew up a privileged and happy child, close to her parents. 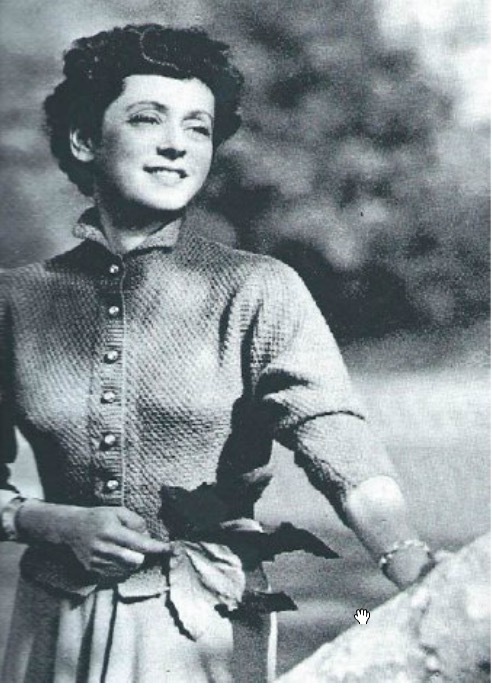 In 1933 she married Paul Kohner, a man of German descent who, after the creation of Czechoslovakia following WWI, became a Czech citizen living in the Sudetenland. Hansi thus became a Czech by marriage, and though she would divorce her husband in part because of his family’s anti-Semitism, this marriage would ultimately help save her life. Following the Anschluss (the annexation of Austria to Nazi Germany) in 1938, her father died and she and her mother were forced to flee after their grand home was taken by Nazi forces. Her mother was unable to escape the Nazi Death Camps, but Hansi’s Czech passport enabled her to board a train bound out of Austria in September of 1938. When Nazi officers boarded the train to question and harass passengers, she slipped into the restroom and, carrying as she always did a small sewing kit, she quickly made a small Czech flag out of her undergarments, scarf and coat linings to pin to her lapel. The Nazi officers ignored her and she was able to eventually make her way to Cherbourg where she boarded the Queen Mary bound for New York. Her occupation in the passenger manifest is “designer,” and it wouldn’t take long for her to establish herself as such in Los Angeles. 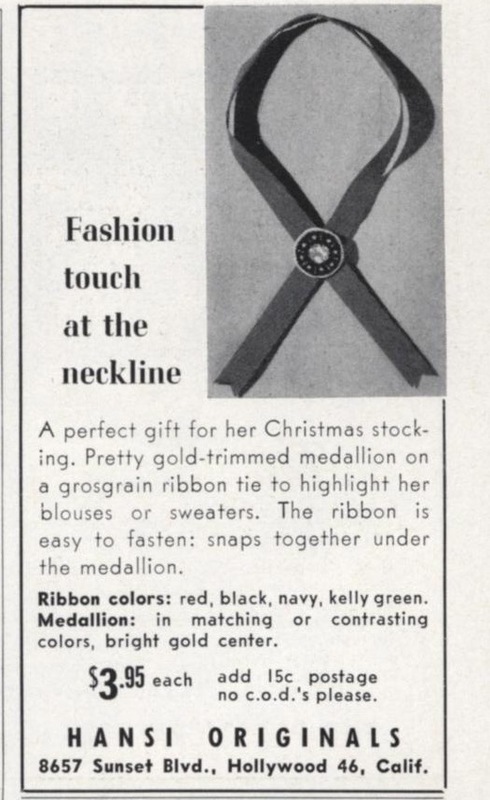 and these medallions on ribbons from 1949, to be worn around the neck. She convinced a manager at Saks to put them on a few of the mannequins, and “by the time I got back to my shop, the phone was ringing. I did what Henry Ford would do: I got myself an assembly line of people making thousands of those ribbons, which eventually sold all over the world,” she recalled in 2006. 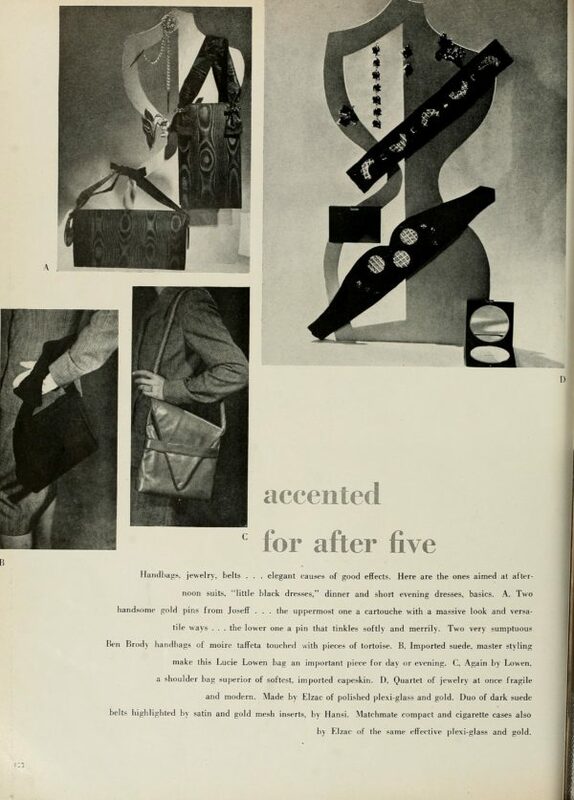 By 1949 she had a small boutique in the Sunset Plaza section of Sunset Boulevard, which still stands today. 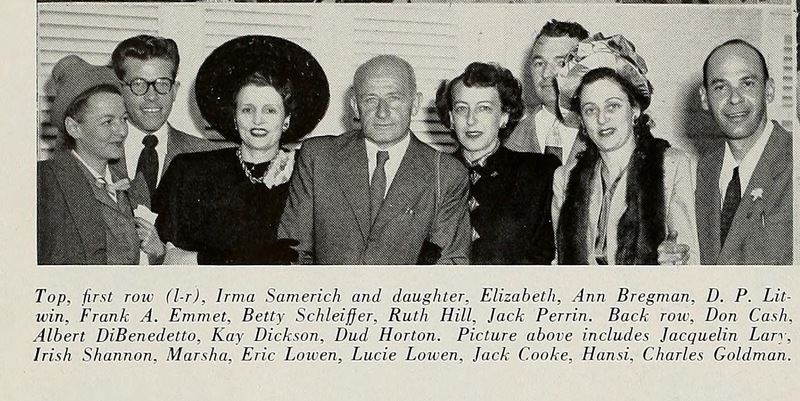 She was a member of the Accessory Creators of California, seen here at an organization event in 1947. 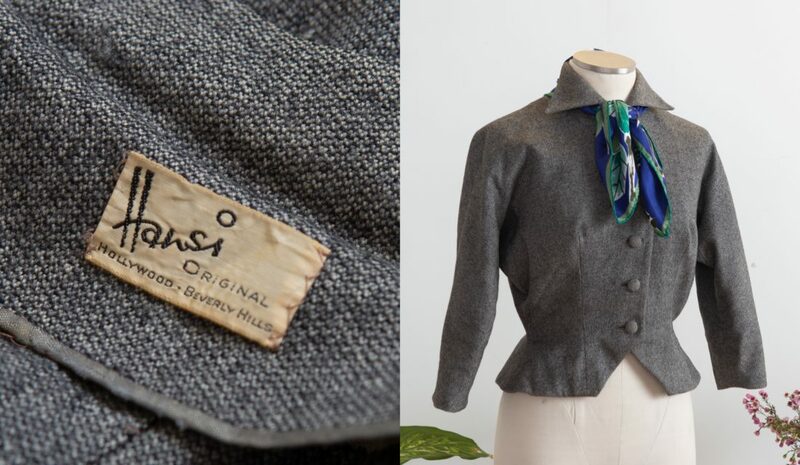 Hansi Originals flourished in the 1950s and 60s, attracting an elite and often famous clientele to buy her hand-knit sweaters and other separates. One of her favorite stories involved Ava Gardner, whom she claimed came into her store after Frank Sinatra had “almost bought up the place, I thought he was going into the dress business… she took [a sweater] and told me to charge it to Sinatra.” Hansi refused and told Miss Gardner she’d have to pay cash like anyone else, who which a shocked Ava reportedly replied, do you know who I am? 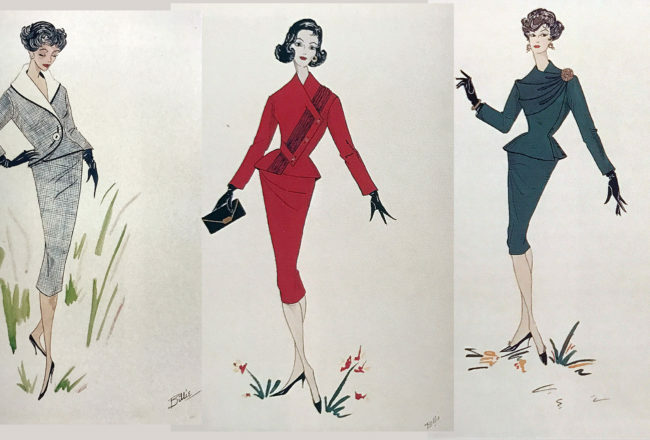 “You are Ava Gardner, and you don’t have a charge account.” She closed the boutique in the 1970s, when she says her clientele had become “spoiled rich women who had more clothes than they knew what to do with.” She died in 2009 at the age of 100, completely unimpressed with fashion today. “There is no fashion at all. It’s just a presentation of body parts. It all started with a fig leaf, and that is exactly where it’s going to end up,” she said in 2006.